Anyone saving their pennies for an iPad might want to click somewhere else, or at the very least, watch the following clip through their fingers. 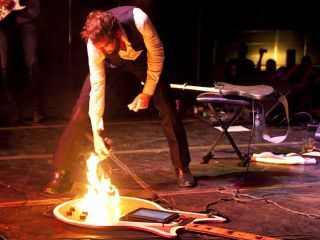 For reasons best known to themselves, awesome indie rockers Band Of Horses decided to attach an iPad to a giant guitar, and subsequently torch it onstage at a recent Memphis live show. Now watch as it burns! Follow Band Of Horses on Twitter to see what they set fire to next.